Measure your existing mat when fitted on the trampoline. 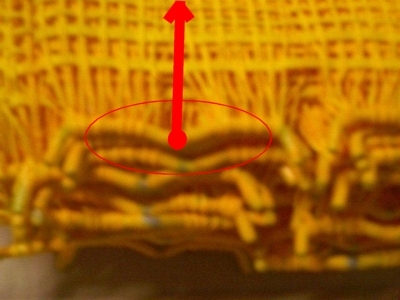 Measure from the tip of the spring, where it attaches to the mat wire. Also, count how many mat attachments. Measure from tip of spring, where it attaches to mat wire. Two-string trampoline mats need to be re-painted every 3 years (for our current rubber-based mats, selling since Aug 2014). For our previous water-based mats, re-painting is required once or twice per year (depending on usage and sun factor). Re-painting protects the strings from UV damage and ‘wear and tear’. Paint is available from large paint retailers or phone us for information. Paint your mat ON the trampoline with a foam roller. Do on top and underneath. Go around the mat-wires with a paint brush. An un-painted mat will only last a few years before strings will start to break. Also, strings are very easily damaged by sharp objects. E.g. Shoes, fallen tree branches, pets claws, etc. Once strings break, it is an expensive replacement cost!